Mustang Bolt in Roll cage 4-pt Gray or Red! Watson Racing makes quite simply the finest 4-point Mustang bar on the market. 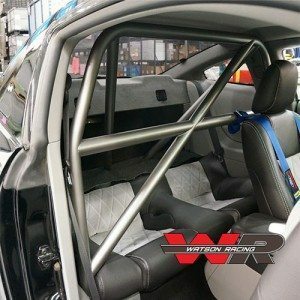 After extensive engineering, Watson Racing is excited to continue its’ bolt-in 4-Point Roll Bar. What makes this 4-Point different? • Quick-In and Quick-Out design. Perfect for those of you who are part-time racers and don’t want a full-time roll bar. Uniquely-engineered bolt-in mounting system stays hidden and mounted in the car. Unbolt the Watson Roll Bar from INSIDE your car for quick removal and re-installation. • Works with the Ford Racing / Boss Laguna Seca X-Brace! Install the 4-point with the X-Brace together with no modifications needed to either piece. Get creative with the seat-delete kits: some customers have modified our Watson 4-point carpet kit to work with X-brace and 4-point, and other customers have modified their Ford Racing seat delete to work with the Watson 4-point bar. • Mounts to the FACTORY corner gussets. Other 4-point bars in the market either bolt to the weak sheet metal floor behind the front seats (dangerous! ), or replace the factory corner gussets with their own design. Why replace what Ford has already engineered and crash-tested? This is a critical strength point in your Mustang, and we did not want to replace it. The Watson Racing 4-Point bar bolts to this factory, high-strength gusset for maximum safety. • Minimal trim panel modification. With our 4-Point Bar’s quick-in, quick-out design, you don’t have to cut your trim panels AT ALL if you don’t want to. If you’d rather keep the trim panels and Roll Bar permanently mounted in the car, the modifications required to the trim panels are minimal. No cutting your time panels in half with our bar! • Minimal-bend design. Bends in tubes reduce a bar’s effectiveness and safety. We kept the number of bends to a minimum in order to maximize safety. Where bends are required, we use a CNC precision mandrel bending process to maintain strength. • We sweat the details: 100% TIG-welded 1.75”x.120”-wall DOM tubing. 100% powder coated. Shoulder harness retention loops, standard. Welded/fixed harness bar and diagonal bar, standard. Precision-machined tube joints for high strength on rear support tubes- no through-bolting here, and notice the plug-welds! Zinc-plated heavy M10 metric fasteners included.